Castle of Frankenstein magazine #26 - First New Issue in Quarter Century! 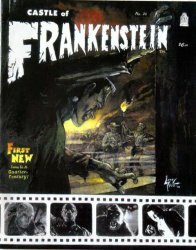 MyMovieMonsters.com > Monster Magazine Marketplace > Castle Of Frankenstein > Castle of Frankenstein magazine #26 - First New Issue in Quarter Century! Castle of Frankenstein #26, published in 1999, was the first new issue since its original run from 1962-1975. Frankenstein Meets the Mask Collectors! 68 pages. Color cover (original art by Larry Ivie had been intended for issue #1) and B&W pulp pages inside. Printed in Summer 1999. Copyright 2016 MyMovieMonsters.com and House of Scary Publishing. Collectors Note: Brand-new and uncirculated. Picked directly from the printer's cartons. You won't find a finer copy of this important issue!